This homemade Italian Dressing Mix is absolutely the BEST way to make Italian Dressing! The mix uses a blend of every day spices for the perfect mixture of seasonings bursting with Italian flavor. You can use this mix to make homemade Italian dressing, or to season meats, veggies, potatoes and more. This mix can be made in minutes with spices from your cupboard and is even better than the stuff you buy at the store. One batch can be stored it to use for days, weeks, or months. Not only is this Italian Dressing Mix delicious but it is also gluten and dairy free. For YEARS I have been buying Italian dressing mix at the store. I love the taste of homemade Italian dressing, but I also love to use it as a seasoning for meats, veggies, potatoes and other foods. It is quick, convenient and has great flavor. The last time I was at the store I had kind of a “well DUH!” moment where I realized that since I make almost all of my other spice blends from scratch (like my Taco Seasoning, Homemade Ranch Mix, Fajita Seasoning and Greek Seasoning) I have no clue why I haven’t tried making this one at home sooner! So home I went and I got into a little reverse engineering and taste testing. I don’t have any secrets from the store, so I can’t say this is an exact replica of the store bought Italian Dressing Mix, BUT I can tell you this is insanely delicious and makes some out of this world dressing! I couldn’t wait to share it with you, so I got it up here on the blog as soon as I could! Before we get into the recipe, I wanted to give you a few places besides just salad dressing that you can use this in your cooking. I have used it in so many things that it hasn’t even been a week and we are already on our second batch. Veggies- Toss assorted veggies with a little olive oil, some of this seasoning and then grill or roast until tender. Pot Roast- Use this homemade Italian Dressing Mix the next time you make a Pot Roast. Italian Cheesy Bread- Spread olive oil over a pizza crust and sprinkle with seasonings, then cover with mozzarella cheese and bake until bubbly. 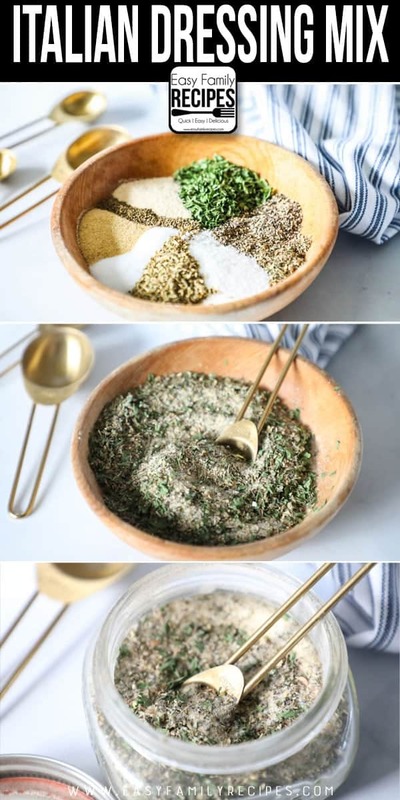 These are just a few of the many ways you could use this Italian Dressing mix. If you have other ideas or favorite recipes that include Italian Dressing Mix I would love for you to share them with me in the comments! Making Italian Dressing mix from scratch is very simple. All you do is measure the spices on the ingredient list and mix them up. I am going to walk through a few of my tips and notes here to hopefully answer any questions that may pop up along the way. 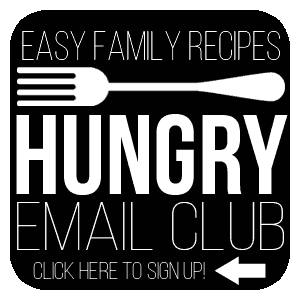 You can find a FULL recipe card that you can save or print out at the bottom of this post. Q: How do I make this into Italian Dressing? A: You can combine 1/4 cup red wine vinegar, 3 Tbsp water, 2 Tbsp Italian Dressing Mix and 1 tsp dijon mustard. Blend in 1/2 cup olive oil and whisk or shake vigorously. Store in an airtight container for up to 4 weeks in the refrigerator. Let sit at room temperature until oil liquifies and then shake or whisk vigorously to recombine before serving. Q: How long does the mix stay good for? A: If your herbs are fresh when you combine them this mix should stay fresh at least a year. To keep help herbs keep their freshness, store herbs and spices in a cool dark place and avoid direct heat or sunlight. Q: Can I leave out the sugar in this mix? A: I wouldn’t advise it. The sugar helps to cut the acidity of the vinegar, lemon or other acid that you will use when making the salad dressing to give it a less acidic or bitter taste. With a serving of this mix equating to about 1/2 tsp when used in a recipe, the amount of sugar in each serving is very small. With that said, if you don’t mind the acidity of the dressing you can try it without and see what you think, or leave it out and add honey or other sweeteners in at another point in the recipe. If you have other questions, please leave them for me in the comments and I will try to update them here! I really hope you enjoy this homemade version of Italian dressing mix as much as we have. I have already passed out the recipe to a few of my friends so make sure and keep the recipe handy when you make it! This homemade Italian Dressing Mix is absolutely the BEST way to make Italian Dressing! The mix uses a blend of every day spices for the perfect mixture of seasonings bursting with Italian flavor. You can use this mix to make homemade Italian dressing, or to season meats, veggies, potatoes and more. Mix all ingredients together until evenly distributed. Store in an airtight container. Mix well before each use. This recipe is naturally gluten free and dairy free. This mix is wonderful. I have been making a similar recipe for many years which did not include the celery seed. I really enjoy celery seed. 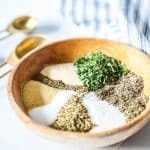 Celery seed seems to be “the best kept secret” for flavoring foods. I have used this italian dressing mix as a dry rub on roasts, added it to mashed potatoes, in vegetable dishes, etc. 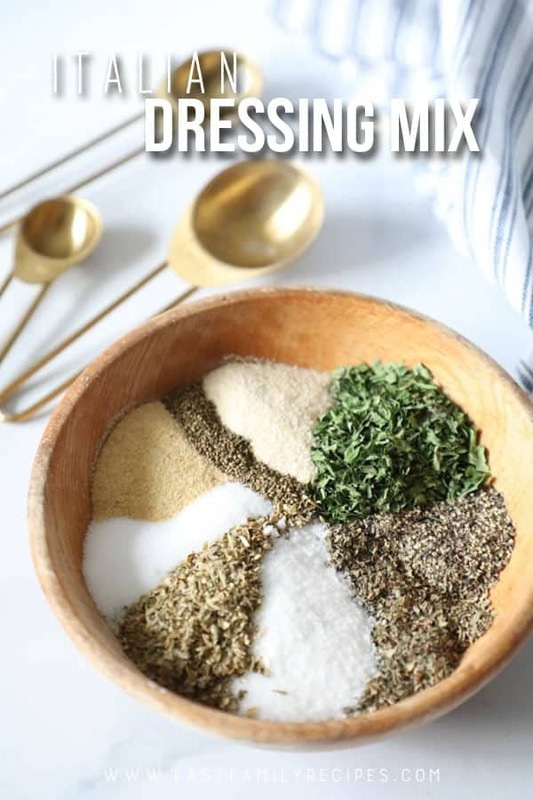 This mix is very versatile, The celery seed is the key (for me). Thank you for posting. I haven’t bought a package of Italian dressing in years……… if the recipe calls for 1 packet of dressing mix how much do you think that would equate to? I would love to sub out the sugar, I know it’s part of what makes the seasoning so good, but any suggestions? Depending on how you use it you may be able to leave it out. If it is a marinade or seasoning on veggies then it’s no big deal. If you are making a vinaigrette then it needs the touch of sugar to cut the acidity. That said you could omit white sugar and use a natural sweetener like honey or try artificial sweeteners but I don’t have a lot of experience with those.